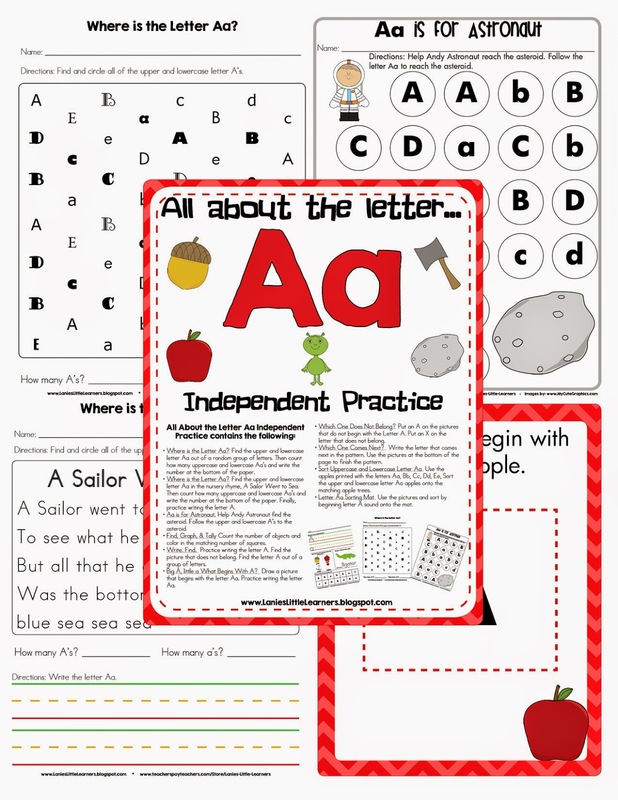 The All About the Letter Aa Independent Practice Packet is the perfect accompaniment to the All About the Letter Aa SMARTBoard Activity. I have used a variety of the activities in both whole and small group instruction. Where is the Letter Aa? Find the upper and lowercase letter Aa out of a random group of letters. Then count how many uppercase and lowercase Aa’s and write the number at the bottom of the paper. Where is the Letter Aa? Find the upper and lowercase letter Aa in the nursery rhyme, A Sailor Went to Sea. Then count how many uppercase and lowercase Aa’s and write the number at the bottom of the paper. Finally, practice writing the letter A.
Aa is for Astronaut. Help Andy Astronaut find the asteroid. Follow the upper and lowercase A’s to the asteroid. Write. Find. Practice writing the letter A. Find the picture that does not belong. Find the letter A out of a group of letters. Big A, little a What Begins With A? Draw a picture that begins with the letter Aa. Practice writing the letter Aa. Which One Does Not Belong? Put an A on the pictures that do not begin with the Letter A. Put an X on the letter that does not belong. Which One Comes Next? Write the letter that comes next in the pattern. 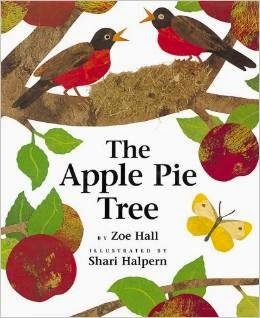 Use the pictures at the bottom of the page to finish the pattern.Sort Uppercase and Lowercase Letter Aa Use the apples printed with the letters Aa, Bb, Cc, Dd, Ee, Sort the upper and lowercase letter Aa apples onto the matching apple trees. Letter Aa Sorting Mat Use the pictures and sort by beginning letter A sound onto the mat. Directions: Print Sort Uppercase and Lowercase Letter A and the Letter Aa Sorting Mat on card stock and laminate for durability. ]If you have any suggestions and/or comments to make this learning packet better, please feel free to email me at: lanieslittlelearners@gmail.com. 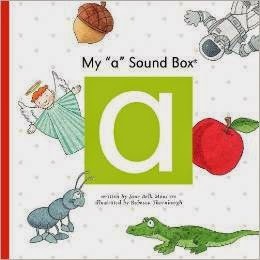 In My "a" Sound Box, "Little a" looks for items that begin with the letter A to collect in his sound box. The book has repetitive text, word/picture correspondence, and improves vocabulary. I have bought the Kindle version of the book to project on the SMARTBoard. The kids love coming up and looking for objects that begin with the letter A or helping me turn the pages. What will Abby Alligator be? Maybe an artist, an astronaut or an actor. 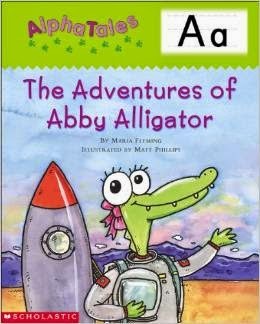 Share Abby's adventures in real world settings to teach and reinforce the letter A. The book contains colorful images which take you through the seasons of an apple tree. From a brown and bare winter to a ripe red fall… and finally a delicious apple pie you grew yourself.